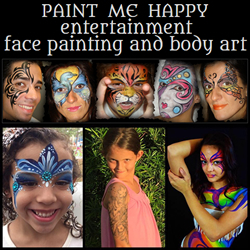 Bringing smiles to the Tampa Bay and St. Petersburg Florida area, Paint Me Happy is a Face Painting and more entertainment company helping you bring joy and excitement to your party, event, or other gathering. Call and book your professional face painting and body art services, temporary henna art and tattoos, prenatal belly art, airbrush art, balloon twisting, and more. Like Paint Me Happy on facebook and check out some great examples of services today.